Jett North finishes second is the competition against Tesoro. Photo by Ellen Lougee. With a win in San Clemente this week against Tesoro, the Laguna Beach High School surf team is now 5 and 0 in the Scholastic Surf Series this season. Jameson Roller, one of many team members doing double duty in multiple divisions, competed in shortboard and longboard, where impressive nose rides and drop knee cut backs contributed to his winning in the final. 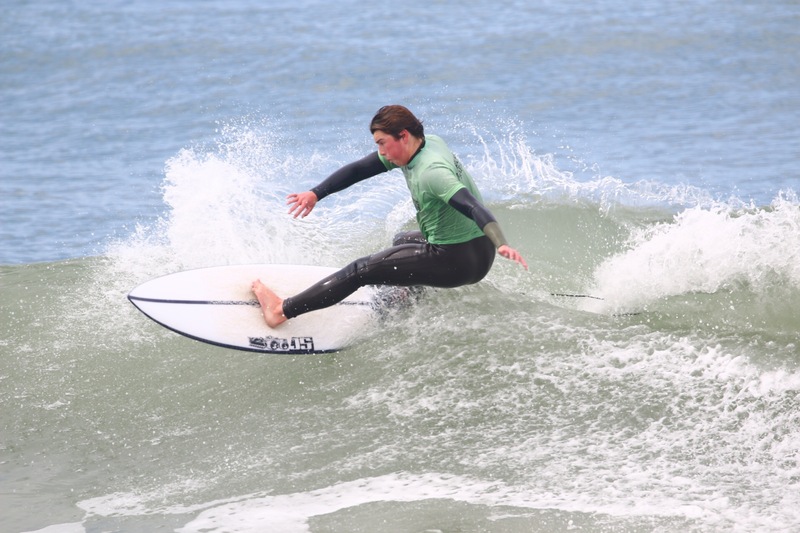 Jett North also surfed in both divisions and finished second overall, followed by Sam Nelsen, who took third overall, and Holden Geary in fourth. Claire Kelly took third in the shortboard final and Destiny Thompson made both finals and took fourth in both shortboard and longboard. Special mention goes out to Sam Starr, who advanced into longboard individuals with some nice surfing; Jackson Jenkins, who surfed in both divisions; and Luca Elegaynan in shortboard. The team next competes April 22 and individuals compete April 24 at Oceanside South Jetty.